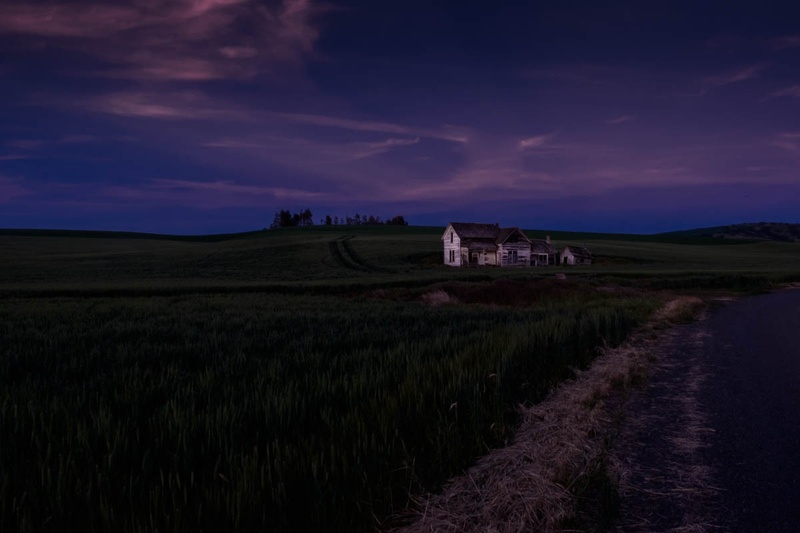 This is the third shot I’m presenting of this spot, Weber House, in the Palouse region of Washington. Previous ones are here and here. I find this version a bit surreal, or cinematic. Not sure what I think of it. I even let it sit for a week or so before coming back to it and continued to be uncertain. My initial reaction on returning to it after the break was extremely negative. Then I sat in front of it for a few minutes and it grew on me. I was not sure what to do. Then I figured, hey, this is just a blog. It’s not like I’m presenting this as my best work. So here it is. Please comment if you’d like to share your view, including if you do not care for it. Thanks Mike. That’s actually helpful. My monitor is, I think well calibrated for color but I struggle with brightness sometimes. The feedback is helpful. Thank you Mark, you inspired me to look through my Weber House images and I found another pano to mess with, cheers!